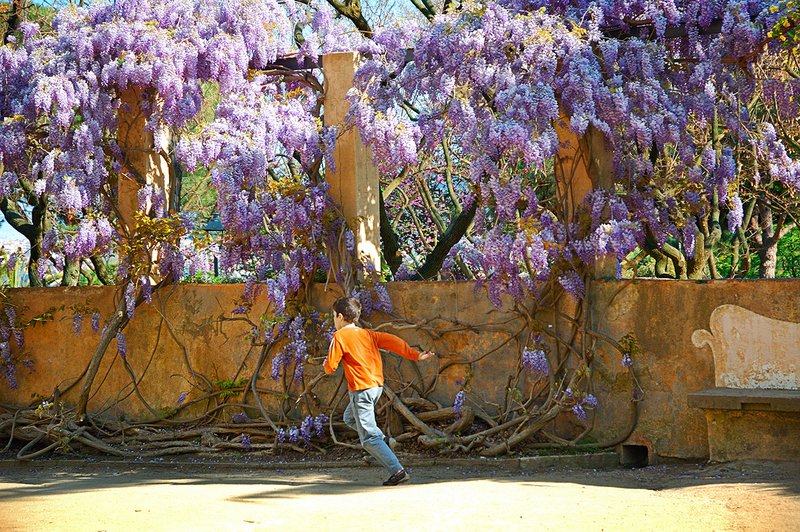 Parc del Laberint (Maze Park) in Horta is a romantic garden at the slope of Barcelona hills. The park, a very idyllic spot and highly recommended to our visitors, has been featured in Barcelona Photoblog in the past although I plan to show two or three new pictures soon. On our way to the exit my daughter Sara and I spotted this kid running against the fence full of flower vines. I told her that there might be a good capture there as she was carrying the camera. She pointed and took a whole series. This in my opinion was the best. Hope you like it too. Of course, that would make her very happy. Your daughter did an excellent job! Very beautiful color and capture of motion. Beautiful photo! It looks like you have another professional photographer in the family! Such beautiful purple blooms!! Lovely! Thanks on behalf of my daughter! Thanks for the post suggestion Marta! Beautiful photo. I love Parc del Laberint - very fond memories of time with my children there. Thanks for posting. Salut.